The Elite by UnderCover is the most refined UnderCover tonneau cover to date. It is meticulously designed and engineered, making it the new standard in the aftermarket industry. The Elite has spectacular new features that set it apart. Starting with a completely new design, adding the handle to the back with a BOLT Lock making it codable to your trucks factory ignition key. It also has a new, brighter, and removable LED light. 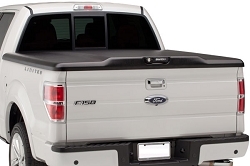 We have made America’s most popular tonneau cover even better.